Microsoft took the developer community by surprise when it renamed ASP .NET 5 to ASP.Net Core 1.0. Why sudden change of mind for the tech giant? Developers would recall how it skipped Serial No. 9 while launching the latest version of Windows operating system last year. But there is more to this move than mere rebranding the .NET framework. Any ASP .NET development company that has tried the latest version of the framework would tell you that it isn’t ‘old wine in a new bottle’ or mere incremental change to ASP .NET 4.6 but a completely new framework. 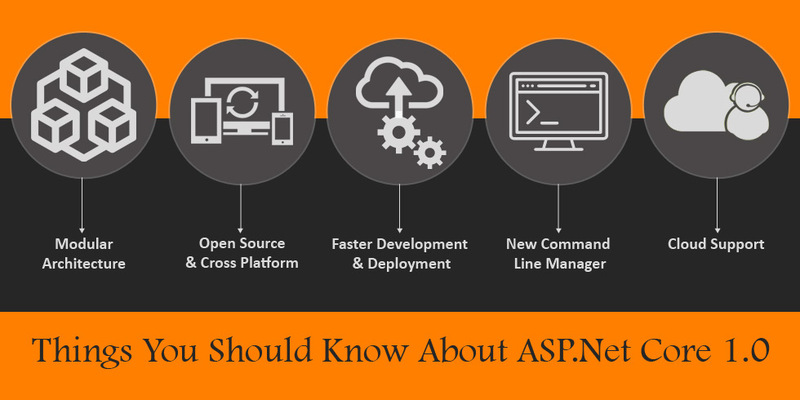 Here are some of the things that you need to know about ASP.Net Core 1.0. One of the key shifts from the previous generation of .NET frameworks has been its modular architecture. As the official site says “NET Core 5 is a modular runtime and library implementation that includes a subset of the .NET Framework.” The new version is relatively lighter and smaller compared to previous version, which helps in speed up the development process. Major changes have been made to the file system that would facilitate a robust development environment. ASP.NET Core 1.0 is open source and Microsoft has left no stone unturned to make it cross platform. You would be able to develop applications on Mac, Linux or Windows systems hassle free, just as the developer community had aspired for. Microsoft has done away with technologies such as PowerShell, which was a big barrier to cross platform development. In fact, it has also introduced a new code editor “Visual Studio Code” specifically for Mac and Linux users. The file system has undergone a complete rewrite and this ensures that you can develop and deploy applications faster compared to the previous framework. When changes are made to the code they are compiled internally in the background. They also update the running application so you can see the changes without refreshing the browser. The new version of the framework also comes with an additional command line tool manager known as DNVM or the Dot Net Version Manager. This command line manager would come handy in updating and configuring .NET Runtime. This is in addition to the.NET Execution Environment or the DNX.